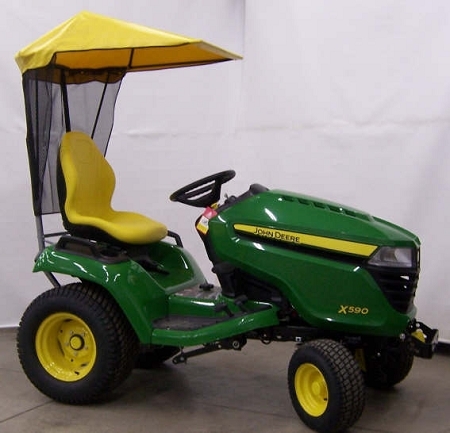 *NOTICE* This sunshade is not manufactured by John Deere, it is an aftermarket item. 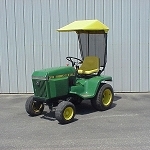 Designed for John Deere (2016) X500 Series. Installation is made quick and simple with illustrated instructions. 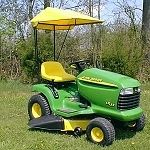 This sunshade features a strong 16 gauge steel frame, and a rip stop, mildew, fire and water resistant yellow vinyl top. This sunshade also features the black screen in the rear to keep the sun off your back. 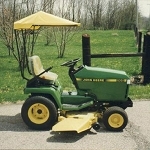 Original Tractor Cab Sunshade Fits John Deere 325, 335, 345, 355D, GX325, GX335, GX345, GX355 Lawn Tractors and more, see fit up list.